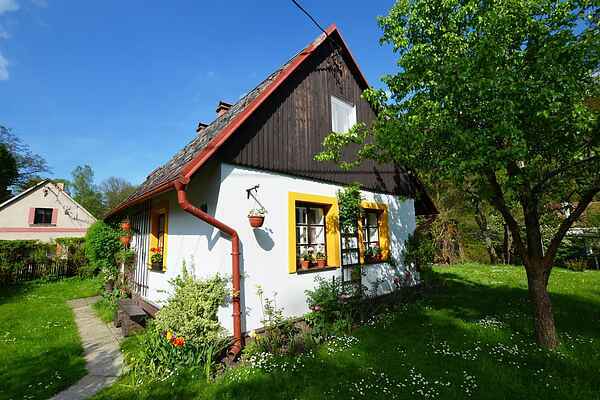 This authentic holiday house (132m) is located in Northern Bohemia, in the Lausitz Mountains ?Luzicke hory? and has an over 1,000 m2 manicured garden with a fire pit. The house is well cared for and renovated in 2007. In the living room, conservatory and the kitchen you can enjoy a fire in the open hearth or tiled stove. The surroundings are suitable for hiking, cycling, swimming, golf (Malevil Golf club, 4 km) or excursions into the Lausitz Mountains or to Germany. In addition, you can visit various castles in the vicinity or visit the city of Liberec with its Aquapark and many cultural and shopping options. The ski centre of Jested (23 km) and other ski resorts in the Iron Mountains "Jizerske hory"(35 km) are quickly accessible for your skiing pleasure. Nordic skiing is available in Germany (5 km).